SHIPPING INCLUDED! ON SALE - Manzanita in modern metallic gold with a gloss finish. A perfect choice for use with crystals, weddings and anniversaries. 18"-24". Add one or two pieces to your existing centerpiece. These pieces are not as full as our regular shipped pieces, however are perfect for filler, and are offered at a greatly reduced price. Seasonal item, limited quantities during the Summer months. Fully available September through late May. 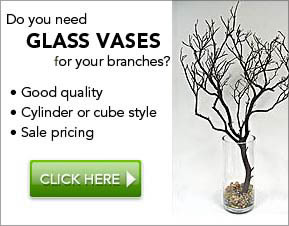 Two of these filler pieces together can also make a very nice centerpiece, although are best suited for trimming and used as additions. Height approximately 18"-24". Branch area approximate width 4"-6". NOTE: Not as full as our regular branches. These are best when used as supplements. Due to time required to prepare color branches, expedited orders are not possible. Please order well in advance! Product photo is an example only. They were great and looked classy and elegant at our wedding! They were almost late - make sure to order well in advance. Our order was delayed because there was a small additional shipping charge that I needed to approve but didn't see for a few days. Then the company was closed for the thanksgiving holiday and weekend, I believe. However, I emailed the company to make sure the branches would come in time and a representative got back to me the following Monday via the phone. They were helpful and responsive!